Pair of traditional, barrel-style solo seat springs, 3 inch height. These are heavy duty springs that are black electroplated, superior in durability to powdercoat. 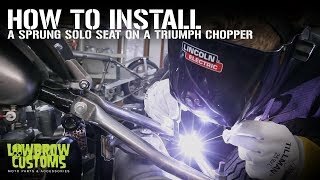 Solo seat springs support the rear of your sprung motorcycle solo seat, while a solo seat pivot allows the front to move, giving your body some suspension as you ride down the road. Price is per pair. Exactly what I needed. Did the job perfectly! These springs were super stiff which is exactly what I was looking for. The only thing I would change is it would be great if the ends were ground flat so the springs would sit a little nicer an the perch. Yes, these are sold in pairs as pictured. 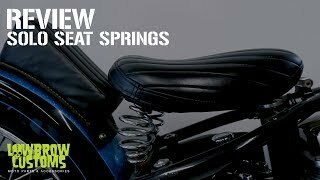 Are the springs weight specific to a rider? Will i bottom out with two inch springs but not 3 inch if i weigh 225lbs? There is not any weight ratings for the springs we stock . I honestly do not know which ones would be better for your application but it is doubtful they would be able to compress all of the way .